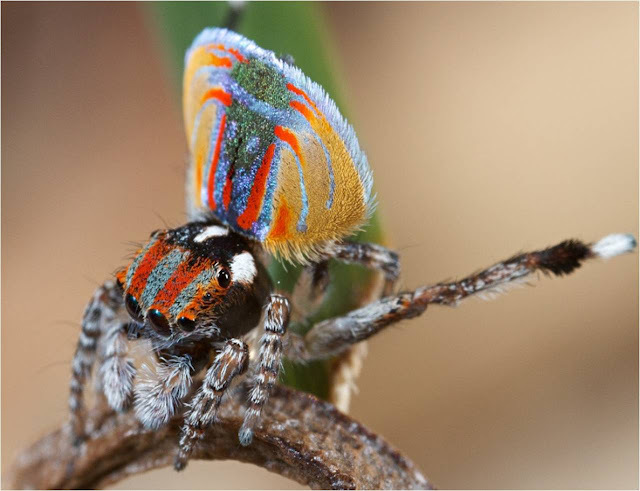 Australia is home to many strange and unusual animals, something the majority of us know. When asked, most people would say that it is the marsupials of the country that are the most significantly different to the rest of the world. 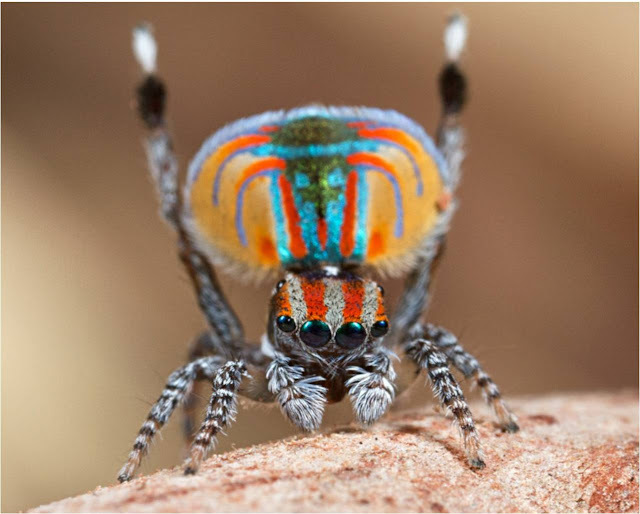 Perhaps that assumption should be questioned – Australia is also home to the tiny Peacock Spider, whose behaviour and appearance is nothing short of startling. 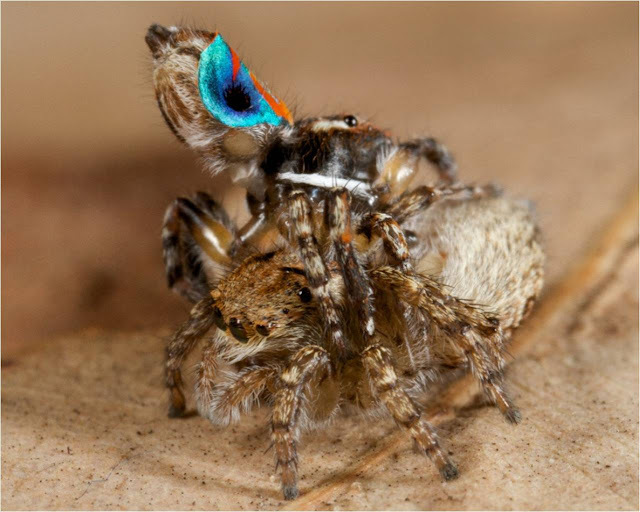 This species waves it legs when first in courtship mode – and you might think that bizarre enough. Although one should hesitate to anthropomorphize any animals, it does look like he is beckoning prospective partners to him with something akin to a cheeky wave. And perhaps he is, but when he raises a pair of patterned flaps this elaborate courtship process goes from the comically strange to the extraordinary. 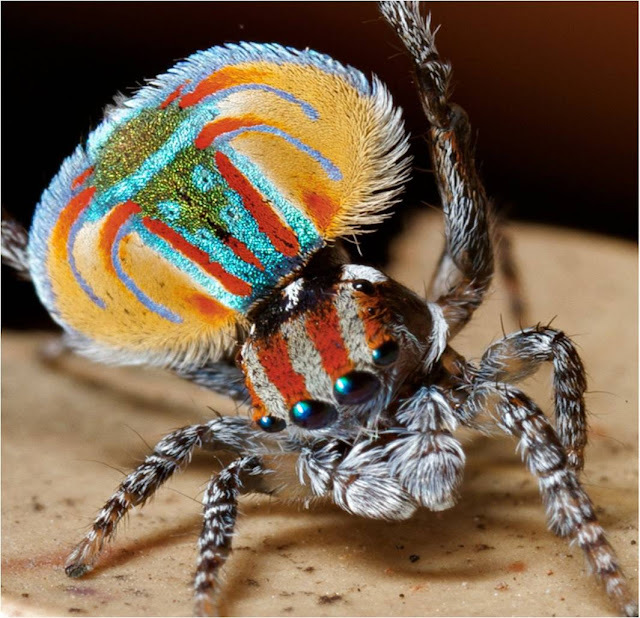 There is little wonder why its common name is the Peacock Spider. 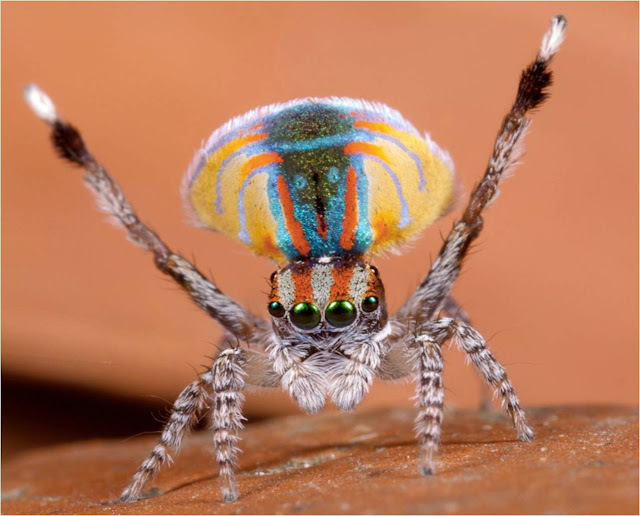 The head-breast part (or cephalothorax) of the Peacock Spider are usually a deep brown color with red stripes and the upper abdomen green and patterned with broad stripes of blue and brown. 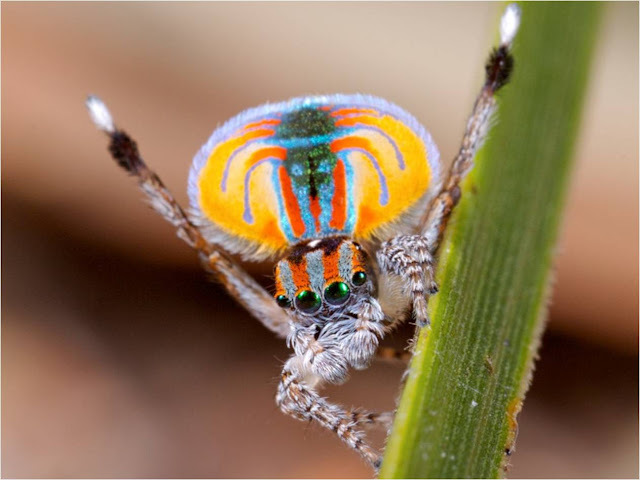 And then there is the gorgeous pair of flaps which, when he is not in pursuit of a lady friend, lie against his abdomen like the cape of some kind of arachnid super hero. They they are, down at his sides. Then, it's up for action! 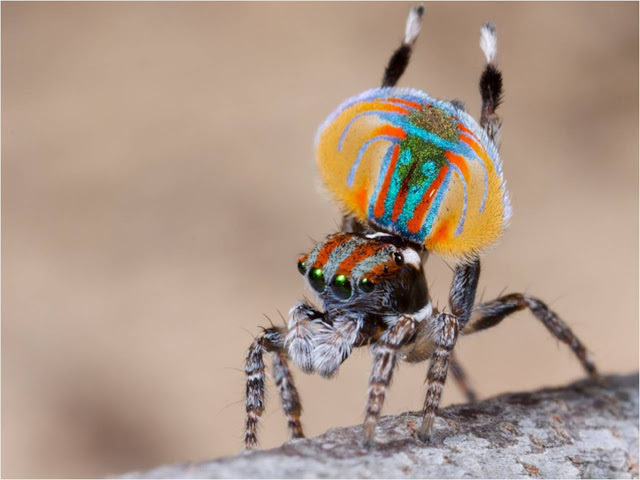 Technically he is known as Maratus volans and he is a jumping spider, found only in the Queensland and New South Wales area of eastern Australia. 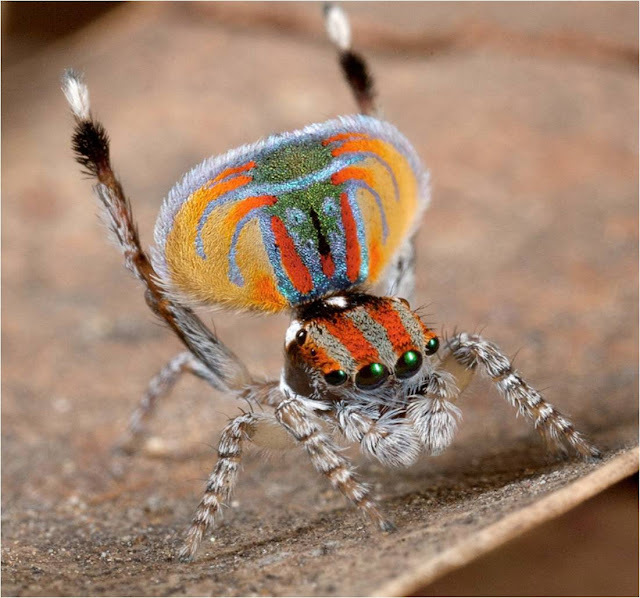 The species was first described by Octavius Pickard-Cambridge in the late nineteenth century and he noted, with some understatement that “it is difficult to describe adequately the great beauty of the coloring of this spider”. By now you will have checked the date of this post, so that you know that even though it was posted in April, it wasn’t on the first of the month. 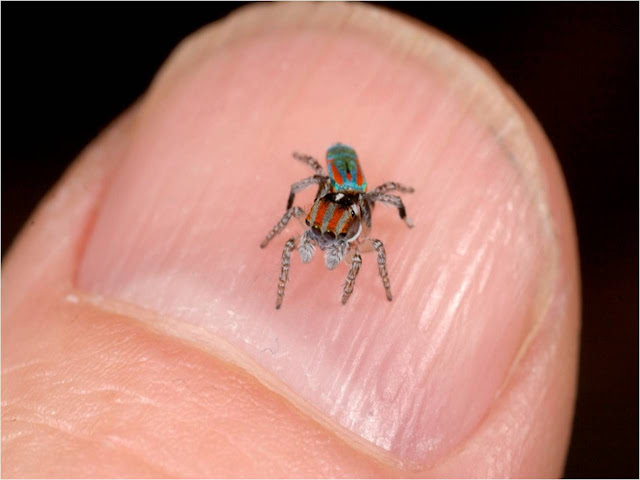 This tiny spider is for real. 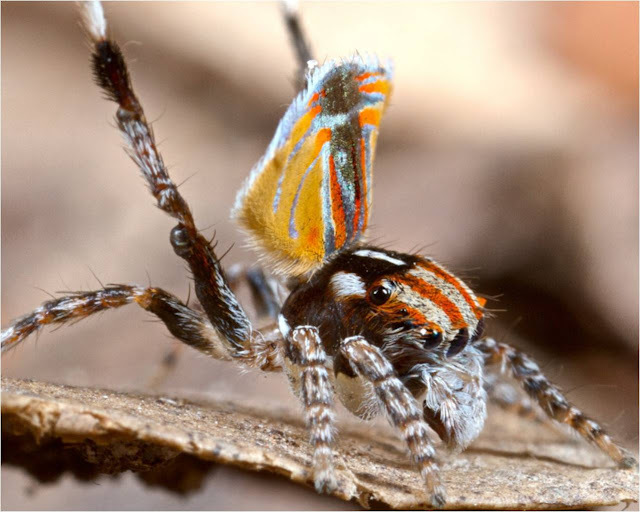 It was originally thought that the amazing flaps were used to aid the spider in gliding, hence the volans in its name. 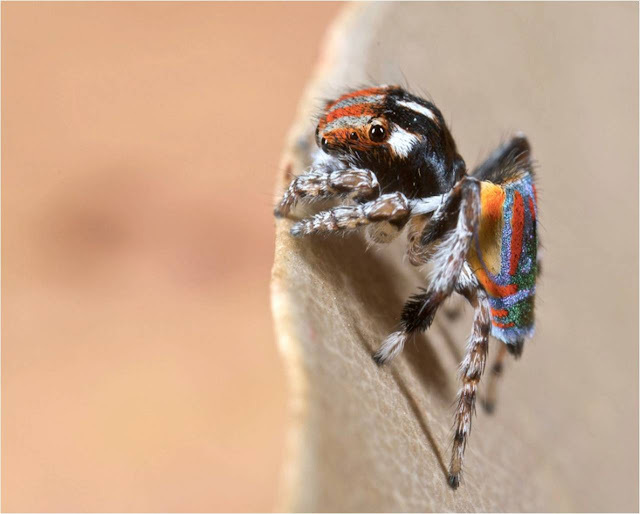 However, they are used solely for a much more down to earth function than that – they are used to attract the (above, approached by the male and rather drab by comparison) female of the species. 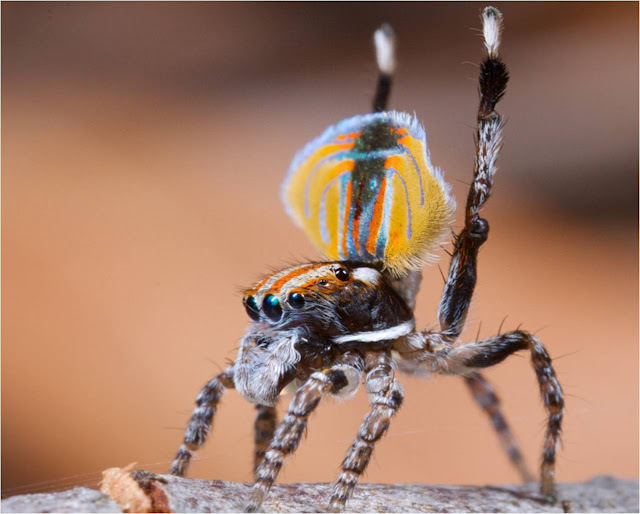 When he wants to catch the fancy of a female the male spider will dance, wave and finally raise his gorgeous abdominal flaps, much in the same way that a peacock raises his dazzling feathers in an altogether quite overt come hither action. 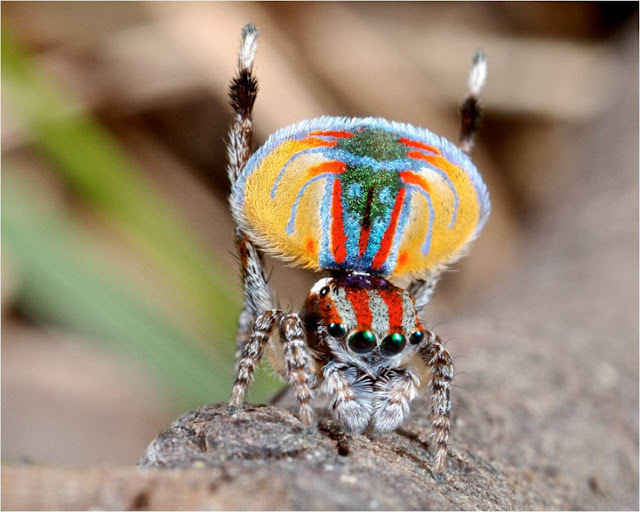 Although a fraction of the size of the avian variety, the Spider Peacock elevates his flaps and reveals a gorgeous display of orange, yellow, green and blue. 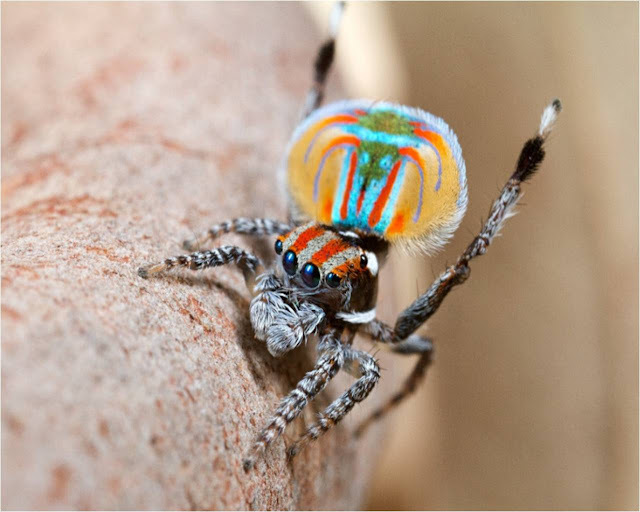 From our perspective the site is extraordinary – who can say what goes through the mind of the female spider when she catches sight of this amazing spectacle? 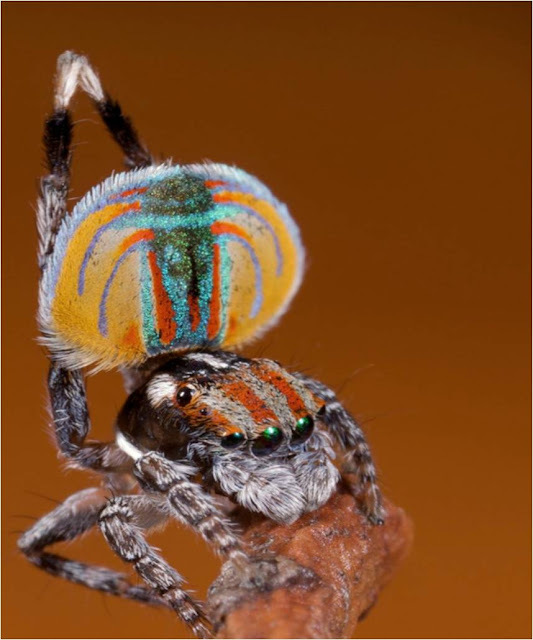 Once aroused by the proximity of a female, the spider will vibrate his flaps with his raised legs, no doubt giving their iridescence a little extra shimmer. Simultaneously he will swagger and roll as he approaches the female. You can almost imagine him singing sea shanties as he does this. The act itself follows. 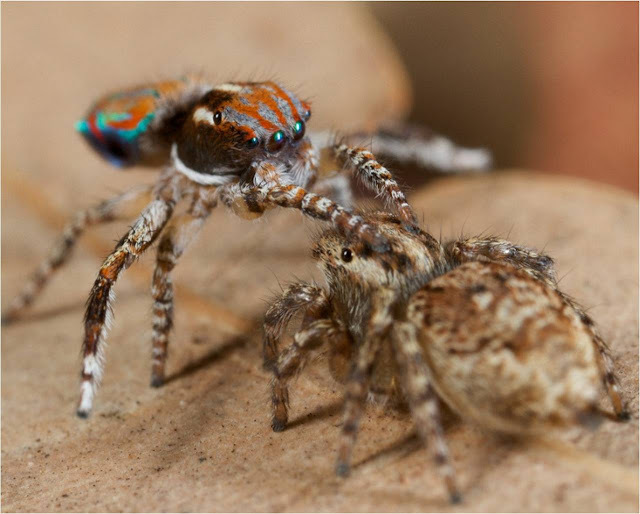 Once he has mated, this amazing dance will be repeated as often and with as many females as possible. After all, the more he can impress the more likely it will be that his genes will be passed on to the next generation. And if you’ve got it, flaunt it. 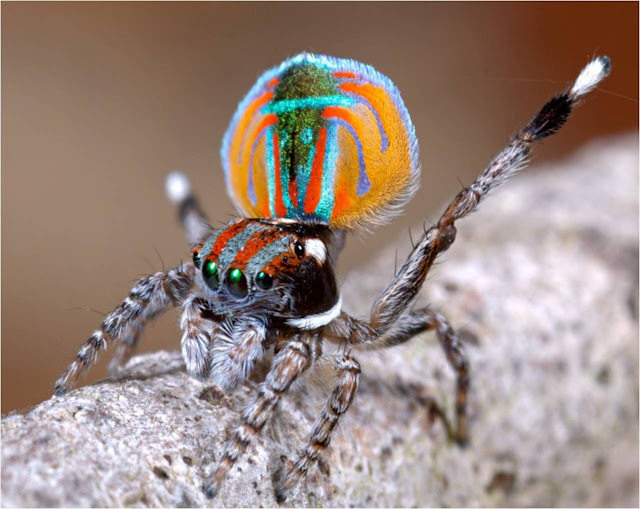 Super heroes are often associated with large size and it must be said that the Peacock Spider is tiny – adults will at their very largest be a mere 5mm in length. 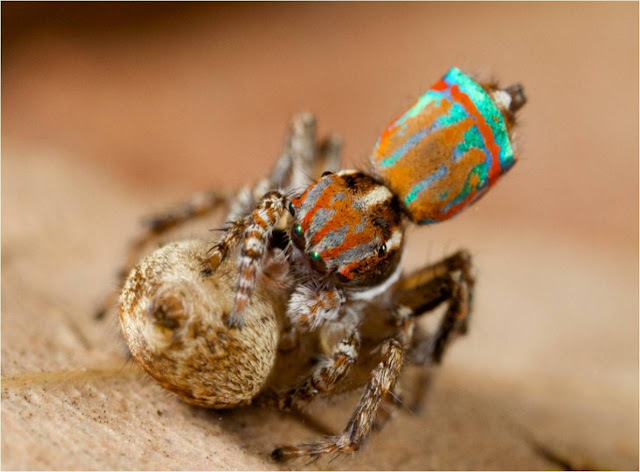 Yet when it comes to the mating dance this tiny spider shows that when it comes to impressing a female, size is most certainly not everything. These marvellous pictures were taken by photographer Jurgen Otto and Ark in Space would like to thank him for allowing us to reproduce these amazing pictures. Above, here is Jurgen explaining more about the Peacock Spider.